I love Mario Kart. Perhaps that's why the series' shortcomings are so frustrating to me. Sure, the controls are always solid, the tracks are fun, and playing with friends never gets old, but Mario Kart is also wasting a huge amount of untapped potential. Every iteration, all we get are new tracks, a new selection of characters, a gradually improving multiplayer mode, and minor gimmicks that do little to change the game in any significant way (motorcycles, gliders, underwater, vehicle customization, anti-gravity). All of that is certainly nice, but every Mario Kart consists essentially of just Grand Prix, Time Trials, and multiplayer (with the exception of Mario Kart DS which had Mission Mode). "Well, of course," I hear you say, "What else would there be?" To which I must reply, "Have you no imagination? Have you not played other kart racing games? Mario Kart could and should be so much more than what it currently is." Fine then. Let me tell you how to make Mario Kart better, so that currently available versions will seem as though mere shells of games. This is perhaps my biggest complaint and suggestion, right off the bat. As I mentioned above, the only things to do offline in Mario Kart as of now are Grand Prix and Time Trials. Yes, you could race against bots in battle mode I guess, but that'd be boring. Honestly, playing the same tracks over and over at different speeds for Grand Prix mode and trying for three stars isn't the most fun thing either, but it's a good, basic, starting point for the game. The main motivation for going through all this is to unlock all the tracks and characters and to get stars next to your name online. Then we have Time Trials, an essential part of any racing game. Setting amazing records can be its own reward, but you can also try to unlock and beat staff ghosts here. The problem is, those two modes are still rather bare bones and boring. That doesn't mean we need to get rid of them, it just means there need to be minor changes and something else worth doing offline in Mario Kart. One of the best ways to increase a game's replayability is to have as many unlockables as possible. We've got vehicles, characters, staff ghosts, and tracks, but we could have alternate costumes, music, trophies, online badges, and more. Look what the achievement grid did for the otherwise content-starved Kirby Air Ride (the achievement grid also returned in Super Smash Bros. Brawl and Kid Icarus: Uprising). That game had hardly anything to do on its own, but it had solid gameplay and a buttload of random challenges to do throughout each mode because of the achievement grids. The goal doesn't always have to be finishing first; why not have minor goals for finding shortcuts, winning without items, or performing a certain number of turbo boosts during the race. It should go without saying that grinding for coins to unlock stuff, as in Mario Kart 7, is a terrible idea. An achievement grid for each mode is an easy way to increase replayability. Now that I'm thinking about it, why don't we just have Sakurai make the next Mario Kart. Time Trials is good as it is, but its rewards need to be better and more clear. If there are going to be unlockable staff ghosts, make a show out of it so the average player knows that it's something to shoot for. 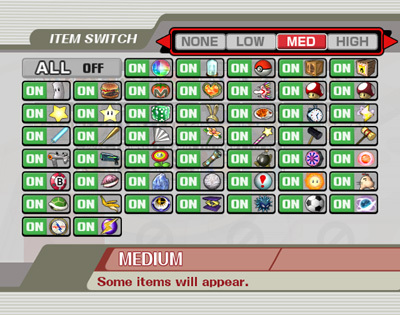 Sprinkle some of the normal unlockables in this mode too so it doesn't just get ignored. Grand Prix is fine and all, but it shouldn't be the focus of single player. Oh yeah, I went there. I can't be the only one who thinks playing the same tracks over and over against bots isn't the most fun thing ever. Well it turns out that other kart racing games figured this out a while ago. Diddy Kong Racing, Crash Team Racing, and ModNation Racers all have Mario Kart beat in the single player fun department. Why? Because they take things one race at a time and make a big deal about collecting whatever is required to open up the next races. 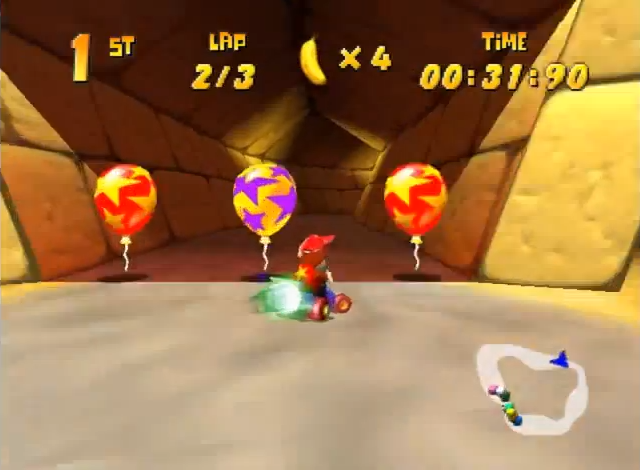 But the biggest reason is that they don't simply have you racing for first every time; there are also alternate challenges for each level such as collecting ten coins hidden along the track and still finishing first or racing against bosses who drop hazards. And when you play tracks one by one, you can make the difficulty higher without being frustrating, since you'll only have to replay one track instead of the whole grand prix if you lose. Mario Kart doesn't need a story mode for the story, but it could certainly use one for the variety of challenge and the feeling of progression and achievement. 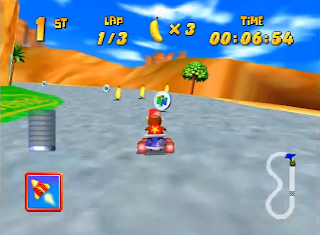 Diddy Kong Racing, 1997, still a better single player mode than modern Mario Kart. Also a track editor and the ability to share tracks online. Please and thank you. More things to do on the same tracks and Sakurai's ever popular achievement grid are my biggest requests for future Mario Kart games, but my suggestions don't end there. Thank your lucky starman, multiplayer in Mario Kart is improving. In fact, it's actually pretty darn good now, but there are still some baffling omissions. I won't spend much time here because there aren't that many changes to suggest and because most people who have played Mario Kart games online already know what sort of things need to be improved. First, we've got the minor stuff. When playing with friends, it should be easier to communicate with people instead of just using preset phrases. 3DS and Wii U have microphones and cameras built in now, can't we incorporate those into the game, at least in lobbies? Seeing my opponents' faces on the side of the screen would be an awesome touch too, just to see how ticked they are to lose to a blue shell at the last minute. 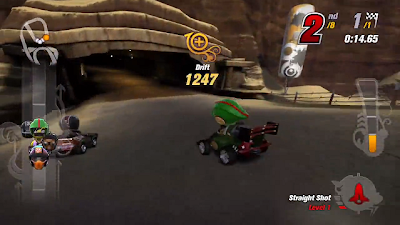 Then, in Mario Kart 7, any one person could start a race going from the lobby when playing with friends or communities. It's as if the developers haven't played any other online games (I wouldn't doubt that being the case, honestly). Is it too much to ask to make one person the host or to vote to start? Mario Kart needs an item switch too. Gameplay in Mario Kart is generally solid, but it could still learn a thing or two from other kart racing games. The motorcycles, gliders, and driving underwater were hardly worth mentioning and certainly weren't revolutionary changes to the franchise. And Mario Kart 8's gravity defying tracks? That's essentially just aesthetic, so big whoop. (Update: It turns out that MK8's anti-gravity does add a small gameplay innovation in the form of bumping other racers for a boost.) Reintroducing coins for a slight max speed increase or drafting behind competitors, those were some steps in the right direction. When it comes to kart racing gameplay, ModNation Racers probably has it best (which makes up for its egregiously long load times and forgettable art direction)*. It has a meter that fills up from drifting, doing tricks, and whatever else. This can then be used to either boost or to deploy a shield to guard against incoming attacks. The items work similarly to Diddy Kong Racing in that you can hang onto an item and get another one to power up the one you currently have. The golden standard of kart racing gameplay, customization, and how long not to make loading times. Now admittedly, Mario Kart's target demographic is absolutely everyone, so that means it has to keep things relatively simple. ModNation Racers' boost / shield meter would probably present too much of a learning curve for younger players and I don't see that being added to the game, as much as I'd love a way to consistently block blue shells. An item block redesign, on the other hand, would be very doable. What kind of item do you want? It's up to you! The other way to tone down Mario Kart's randomness problem is to color code the item blocks. 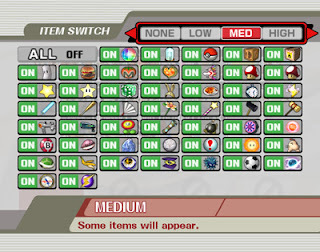 Certain colors would always contain boosts or defensive items or offensive items, which could still be given out semi-randomly according to your position in the race (i.e. someone in first place isn't likely to get a triple red shell from an offensive item block). This simple change would give players an extra bit of control and strategy in how they play the game. Leveling up items by collecting more of the same type of block would also be a nifty feature. Of course, since we added in all those options earlier, you'd still be able to revert to simple mode, where every block can give every item as is currently the standard in Mario Kart games. And one last thing: this game could stand to be a bit faster. No one wants to play on 50cc, but even 150cc is a bit slower than I'd like. I know this isn't F-Zero, but some increase in vehicle speed would certainly be welcome. What? Snaking and rubber-banding AI? Yeah, I wasn't going to mention those because I don't think they're as big of a deal as people make them out to be and talking about them only makes people argue about stupid stuff instead of more important stuff. But fine, my opinion is that rubber-banding AI is fine and that snaking is simply being very good at doing turbo boosts and there's nothing wrong with that. The only reason I prefer a turbo boost system that doesn't involve mashing left and right repeatedly is because I don't want to wear out my controller or my thumbs. *ModNation Racers does have some flaws in its gameplay as well, but it's still very good overall. I've also heard that Sonic & All-Stars Racing Transformed is good, but I haven't had the chance to try it myself. Alright, so did I miss anything? Think I'm full of crap? Let me hear it in the comments! Also check out "Improvements to Pokemon that GameFreak Doesn't Have the [Poke]Balls to Make" and "Building the Next F-Zero"!